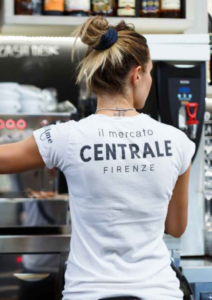 I visited Florence a few days ago and was pleasantly surprised to discover a truly unique place, the Mercato Centrale, or Central Market. 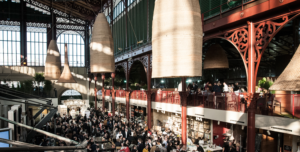 The project dates back to 2014 when Umberto Montano and Claudio Cardini decided to give Florence back one of its most important locations: the first floor of the San Lorenzo covered market. What struck me most was the atmosphere in the place, and obviously its graphic identity. 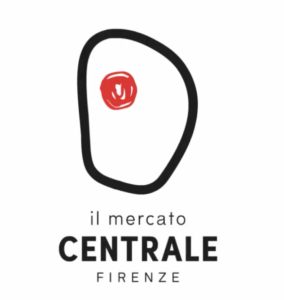 The market has been given a gestural, minimalist, disarmingly simple logo that even a child could have made. And this is exactly why it is so interesting and unique. Jonathan Calugi, the graphic designer who created it, followed his instinct and decided on an almost primitive approach, breaking all rules of proportion, dimension… making everything original and different from so many other identities. Jonathan gave free rein to his natural impulse and drew a gestural red dot in an imperfect black circle, a dot that anyone could make with a pen when looking for something on a map. Equally interesting is Jonathan’s ability to remain consistent with the rest of the identity and to maintain this irrationality in all the other applications, without losing sight of colors or style. Jonathan is an illustrator whose use of clean, minimal lines proposes wholly contemporary images that are sometimes figures but often patterns with motifs that repeat themselves like modules. He never went to art school, but his passion has taken him all over the world. After having worked for Nike, Apple and Sony he now continues to work for overseas clients from his studio in Pistoia. It’s impossible to describe Jonathan in a single word. 180 ID Jonathan Calugi from Canal180 on Vimeo. He’s an artist, an illustrator, a graphic designer, an all-round ideas man. Thanks to his masterpieces, he leads us to believe we could still create so much and contribute to this fiercely competitive world. According to Jonathan, the greatest passion is personal exploration, the only thing that allows you to change things and he has been successful in his desire to do just what he wanted to do. In 2010, he was proclaimed new visual artist of New York’s Print Magazine and was included in the list of the 50 designers under 30 in ART Director of New York. 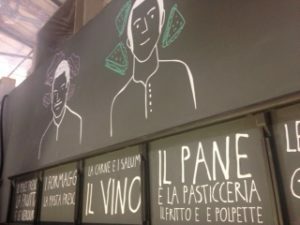 I glanced around at Jonathan’s work and felt imbibed with energy and enthusiasm. I began to wonder why this young artist had been noted abroad and awarded in America, and why I had never heard anything about him until then. I hadn’t even read anything about him in the specialized Italian magazines. He created his first works in New York after having published his illustrations in online magazines and had immediately received job offers. Why do we always show our appreciation after others have done so? Do we always need someone to tell us or confirm that someone’s talent is worthy of recognition? After having terminated the overwhelming task of finishing my florentine steak I thought, thank heavens we’ve got technology and media allowing us to work world-wide. I hope that in future, young designers like Jonathan will always have the chance to open up to the entire world and make themselves known for what they are worth, from north to south and from east to west.